Elvis Costello long ago realized that, his legacy as a songwriter having been secured, he can embrace pet projects that can take him out of his comfort zone without putting a dent in his reputation. As one would expect with these outside-the-box efforts, the results are incredibly varied. Costello can frustrate (his neo-classical works and collaboration with a string quartet) as often as he can thrill (his still-engaging pop album with Burt Bacharach). 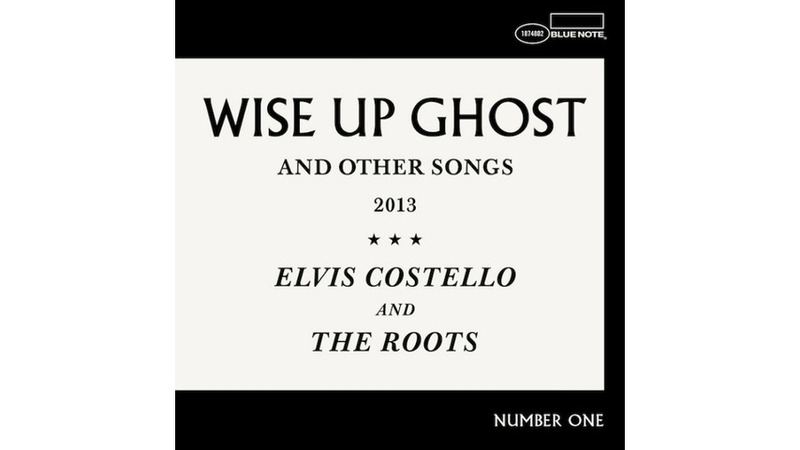 The great news is that Wise Up Ghost, the full-length co-mingling of Costello’s talents with that of The Roots, falls strongly into the latter category. The surprise comes from how easily Costello’s somewhat reedy voice melds into the soupy mix of Dilla-inspired soundscapes and disco string-stabs cooked up by the Roots. The late-night TV house band and hip-hop provocateurs don’t change their approach to playing one iota, riding steady grooves into the sunset and dabbing them with mischievous touches like the front-desk bell that chimes in throughout “Come The Meantimes” or Questlove’s meandering percussion on the title track. That this collaboration would end up working so well should really be of little surprise to longtime fans of Costello. His ‘70s and ‘80s work often bore the influence of the same R&B, soul and funk records that the Roots clearly adore. But via the Attractions or any of his other backing bands, those forces were often swallowed up beneath a maelstrom of pub-rock antics and Phil Spector-style productions. Without such concerns, Costello simply settles into the deep pocket of these heated instrumentals and gets good and comfortable. Here’s hoping the “Number One” emblazoned on the front cover means more work like this is forthcoming.